My publications are listed below, with a link to the publisher, a link to a pdf, and an abstract <onmouseover>. They can also be downloaded from my pages on PhilPapers and ResearchGate. My ORCID author ID is 0000-0002-4144-4957. - See also my 'terse CV'. MÃ¼ller, Vincent C. (forthcoming), Can machines think? Fundamental problems of artificial intelligence (New York: Oxford University Press). 250pp. Abstract: Artificial Intelligence (AI) has taken central stage in our imagination of the future. It raises fundamental questions about what it is to be human, what machines can do, and what the chances and risks of this technological development are. This book addresses these fundamental questions directly and seriously; both those that the general public is concerned about, and the ones people who develop AI are facing. MÃ¼ller, Vincent C. (ed. ), (forthcoming), Oxford handbook of the philosophy of artificial intelligence (New York: Oxford University Press). 400pp. Chrisley, Ron; MÃ¼ller, Vincent C.; Sandamirskaya, Yulia and Vincze, Markus (eds.) (forthcoming), Cognitive robot architectures (Cognitive Computation: Special Volume); Berlin: Springer. MÃ¼ller, Vincent C. (ed. ), (2018), Philosophy and theory of artificial intelligence 2017 (SAPERE, 44; Berlin: Springer). 325 pp. Abstract: This book reports on the results of the third edition of the premier conference in the field of philosophy of artificial intelligence, PT-AI 2017, held on November 4 - 5, 2017 at the University of Leeds, UK. It covers: advanced knowledge on key AI concepts, including complexity, computation, creativity, embodiment, representation and superintelligence; cutting-edge ethical issues, such as the AI impact on human dignity and society, responsibilities and rights of machines, as well as AI threats to humanity and AI safety; and cutting-edge developments in techniques to achieve AI, including machine learning, neural networks, dynamical systems. The book also discusses important applications of AI, including big data analytics, expert systems, cognitive architectures, and robotics. It offers a timely, yet very comprehensive snapshot of what is going on in the field of AI, especially at the interfaces between philosophy, cognitive science, ethics and computing.'" Abstract: The European Association for Cognitive Systems is the association resulting from the EUCog network, which has been active since 2006. It has ca. 1000 members and is currently chaired by Vincent C. MÃ¼ller. We ran our annual conference on December 08-09 2016, kindly hosted by the Technical University of Vienna with Markus Vincze as local chair. The invited speakers were David Vernon and Paul F.M.J. Verschure. Out of the 49 submissions for the meeting, we accepted 18 a papers and 25 as posters (after double-blind reviewing). Papers are published here as â€œfull papersâ€� or â€œshort papersâ€� while posters are published here as â€œshort papersâ€� or â€œabstractsâ€�. Some of the papers presented at the conference will be published in a separate special volume on â€˜Cognitive Robot Architecturesâ€™ with the journal Cognitive Systems Research. - RC, VCM, YS, MV'"
MÃ¼ller, Vincent C. (ed. ), (2016), Computing and philosophy: Selected papers from IACAP 2014 (Synthese Library, 375; Berlin: Springer). 282 pp. Abstract: This volume offers very selected papers from the 2014 conference of the â€œInternational Association for Computing and Philosophyâ€� (IACAP) - a conference tradition of 28 years. - - -	Table of Contents - 0	Vincent C. MÃ¼ller: - Editorial - 1) Philosophy of computing - 1	Ã‡em Bozsahin: - What is a computational constraint? - 2	Joe Dewhurst: - Computing Mechanisms and Autopoietic Systems - 3	Vincenzo Fano, Pierluigi Graziani, Roberto Macrelli and Gino Tarozzi: - Are Gandy Machines really local? - 4	Doukas Kapantais: - A refutation of the Church-Turing thesis according to some interpretation of what the thesis says - 5	Paul Schweizer: - In What Sense Does the Brain Compute? - 2) Philosophy of computer science & discovery - 6	Mark Addis, Peter Sozou, Peter C R Lane and Fernand Gobet: - Computational Scientific Discovery and Cognitive Science Theories - 7	Nicola Angius and Petros Stefaneas: - Discovering Empirical Theories of Modular Software Systems. An Algebraic Approach. - 8	Selmer Bringsjord, John Licato, Daniel Arista, Naveen Sundar Govindarajulu and Paul Bello: - Introducing the Doxastically Centered Approach to Formalizing Relevance Bonds in Conditionals - 9	Orly Stettiner: - From Silico to Vitro: - Computational Models of Complex Biological Systems Reveal Real-world Emergent Phenomena - 3) Philosophy of cognition & intelligence - 10	Douglas Campbell: - Why We Shouldnâ€™t Reason Classically, and the Implications for Artificial Intelligence - 11	Stefano Franchi: - Cognition as Higher Order Regulation - 12	Marcello Guarini: - Eliminativisms, Languages of Thought, & the Philosophy of Computational Cognitive Modeling - 13	Marcin MiÅ‚kowski: - A Mechanistic Account of Computational Explanation in Cognitive Science and Computational Neuroscience - 14	Alex Tillas: - Internal supervision & clustering: - A new lesson from â€˜oldâ€™ findings? - 4) Computing & society - 15	Vasileios Galanos: - Floridi/Flusser: - Parallel Lives in Hyper/Posthistory - 16	Paul Bello: - Machine Ethics and Modal Psychology - 17	Marty J. Wolf and Nir Fresco: - My Liver Is Broken, Can You Print Me a New One? - 18	Marty J. Wolf, Frances Grodzinsky and Keith W. Miller: - Robots, Ethics and Software â€“ FOSS vs. Proprietary Licenses'"
MÃ¼ller, Vincent C. (ed. ), (2016), Fundamental issues of artificial intelligence (Synthese Library, 377; Berlin: Springer). 570 pp. Abstract: PT-AI 2013: This volume offers a look at the fundamental issues of present and future AI, especially from cognitive science, computer science, neuroscience and philosophy. This work examines the conditions for artificial intelligence, how these relate to the conditions for intelligence in humans and other natural agents, as well as ethical and societal problems that artificial intelligence raises or will raise. The key issues this volume investigates include the relation of AI and cognitive science, ethics of AI and robotics, brain emulation and simulation, hybrid systems and cyborgs, intelligence and intelligence testing, interactive systems, multi-agent systems, and superintelligence. Based on the 2nd conference on â€œTheory and Philosophy of Artificial Intelligenceâ€� held in Oxford, the volume includes prominent researchers within the field from around the world.'" MÃ¼ller, Vincent C. (ed. ), (2016), Risks of artificial intelligence (London: Chapman & Hall - CRC Press). 292 pp. Abstract: Papers from the conference on AI Impacts (published in JETAI), supplemented by additional work. MÃ¼ller, Vincent C. If the intelligence of artificial systems were to surpass that of humans, humanity would face significant risks. The time has come to consider these issues, and this consideration must include progress in artificial intelligence (AI) as much as insights from AI theory. -- Featuring contributions from leading experts and thinkers in artificial intelligence, Risks of Artificial Intelligence is the first volume of collected chapters dedicated to examining the risks of AI. The book evaluates predictions of the future of AI, proposes ways to ensure that AI systems will be beneficial to humans, and then critically evaluates such proposals. 1	Vincent C. MÃ¼ller, Editorial: Risks of Artificial Intelligence - 2	Steve Omohundro, Autonomous Technology and the Greater Human Good - 3	Stuart Armstrong, Kaj Sotala and Sean Oâ€™Heigeartaigh, The Errors, Insights and Lessons of Famous AI Predictions - and What they Mean for the Future - 4	Ted Goertzel, The Path to More General Artificial Intelligence - 5	Miles Brundage, Limitations and Risks of Machine Ethics - 6	Roman Yampolskiy, Utility Function Security in Artificially Intelligent Agents - 7	Ben Goertzel, GOLEM: Toward an AGI Meta-Architecture Enabling Both Goal Preservation and Radical Self-Improvement - 8	Alexey Potapov and Sergey Rodionov, Universal Empathy and Ethical Bias for Artificial General Intelligence - 9	AndrÃ¡s Kornai, Bounding the Impact of AGI - 10	Anders Sandberg, Ethics and Impact of Brain Emulations 11	Daniel Dewey, Long-Term Strategies for Ending Existential Risk from Fast Takeoff - 12	Mark Bishop, The Singularity, or How I Learned to Stop Worrying and Love AI -'"
MÃ¼ller, Vincent C. (ed. ), (2014), Risks of artificial general intelligence (Journal of Experimental and Theoretical Artificial Intelligence, (26/3) Special Issue: Taylor & Francis). 160 pp. Abstract: Special Issue â€œRisks of artificial general intelligenceâ€�, Journal of Experimental and Theoretical Artificial Intelligence, 26/3 (2014), ed. Vincent C. MÃ¼ller. http://www.tandfonline.com/toc/teta20/26/3# - Risks of general artificial intelligence, Vincent C. MÃ¼ller, pages 297-301 - Autonomous technology and the greater human good - Steve Omohundro - pages 303-315 - - - The errors, insights and lessons of famous AI predictions â€“ and what they mean for the future - Stuart Armstrong, Kaj Sotala & SeÃ¡n S. Ã“ hÃ‰igeartaigh - pages 317-342 - - - The path to more general artificial intelligence - Ted Goertzel - pages 343-354 - - - Limitations and risks of machine ethics - Miles Brundage - pages 355-372 - - - Utility function security in artificially intelligent agents - Roman V. Yampolskiy - pages 373-389 - - - GOLEM: towards an AGI meta-architecture enabling both goal preservation and radical self-improvement - Ben Goertzel - pages 391-403 - - - Universal empathy and ethical bias for artificial general intelligence - Alexey Potapov & Sergey Rodionov - pages 405-416 - - - Bounding the impact of AGI - AndrÃ¡s Kornai - pages 417-438 - - - Ethics of brain emulations - Anders Sandberg - pages 439-457'"
MÃ¼ller, Vincent C. (ed. ), (2013), Philosophy and theory of artificial intelligence (SAPERE, 5; Berlin: Springer). 429 pp. Abstract: Can we make machines that think and act like humans or other natural intelligent agents? The answer to this question depends on how we see ourselves and how we see the machines in question. Classical AI and cognitive science had claimed that cognition is computation, and can thus be reproduced on other computing machines, possibly surpassing the abilities of human intelligence. This consensus has now come under threat and the agenda for the philosophy and theory of AI must be set anew, re-defining the relation between AI and Cognitive Science. We can re-claim the original vision of general AI from the technical AI disciplines; we can reject classical cognitive science and replace it with a new theory (e.g. embodied); or we can try to find new ways to approach AI, for example from neuroscience or from systems theory. To do this, we must go back to the basic questions on computing, cognition and ethics for AI. The 30 papers in this volume provide cutting-edge work from leading researchers that define where we stand and where we should go from here. (Published 10/2012.)'" MÃ¼ller, Vincent C. and Ayesh, Aladdin (eds.) (2012), Revisiting Turing and his test: Comprehensiveness, qualia, and the real world (AISB Proceedings, 7/2012; Hove: AISB). 64 pp. Abstract: Proceedings of the papers presented at the Symposium on "Revisiting Turing and his Test: Comprehensiveness, Qualia, and the Real World" at the 2012 AISB and IACAP Symposium that was held in the Turing year 2012, 2â€“6 July at the University of Birmingham, UK. Ten papers. - http://www.pt-ai.org/turing-test MÃ¼ller, Vincent C. Daniel Devatman Hromada: From Taxonomy of Turing Test-Consistent Scenarios Towards Attribution of Legal Status to Meta-modular Artificial Autonomous Agents - Michael Zillich: My Robot is Smarter than Your Robot: On the Need for a Total Turing Test for Robots - Adam Linson, Chris Dobbyn and Robin Laney: Interactive Intelligence: Behaviour-based AI, Musical HCI and the Turing Test - Javier Insa, Jose Hernandez-Orallo, Sergio EspanÌƒa - David Dowe and M.Victoria Hernandez-Lloreda: The anYnt Project Intelligence Test (Demo) - Jose Hernandez-Orallo, Javier Insa, David Dowe and Bill Hibbard: Turing Machines and Recursive Turing Tests â€” Francesco Bianchini and Domenica Bruni: What Language for Turing Test in the Age of Qualia? - Paul Schweizer: Could there be a Turing Test for Qualia? - Antonio Chella and Riccardo Manzotti: Jazz and Machine Consciousness: Towards a New Turing Test - William York and Jerry Swan: Taking Turing Seriously (But Not Literally) - Hajo Greif: Laws of Form and the Force of Function: Variations on the Turing Test.'" MÃ¼ller, Vincent C. (ed. ), (2012), Theory and philosophy of AI (Minds and Machines, 22/2 - Special volume: Springer). 67-148 pp. Abstract: Invited papers from PT-AI 2011. - Vincent C. MÃ¼ller: Introduction: Theory and Philosophy of Artificial Intelligence - Nick Bostrom: The Superintelligent Will: Motivation and Instrumental Rationality in Advanced Artificial Agents - Hubert L. Dreyfus: A History of First Step Fallacies - Antoni Gomila, David Travieso and Lorena Lobo: Wherein is Human Cognition Systematic - J. Kevin O'Regan: How to Build a Robot that Is Conscious and Feels - Oron Shagrir: Computation, Implementation, Cognition'"
Esposito, Anna; Esposito, Antonietta M; Hoffmann, RÃ¼diger; MÃ¼ller, Vincent C. and Vinciarelli, Alessandro (eds.) (2012), Cognitive behavioural systems (LNCS, 7403; Berlin: Springer). 450 pp. Abstract: This book constitutes refereed proceedings of the COST 2102 International Training School on Cognitive Behavioural Systems held in Dresden, Germany, in February 2011. The 39 revised full papers presented were carefully reviewed and selected from various submissions. The volume presents new and original research results in the field of human-machine interaction inspired by cognitive behavioural human-human interaction features. The themes covered are on cognitive and computational social information processing, emotional and social believable Human-Computer Interaction (HCI) systems, behavioural and contextual analysis of interaction, embodiment, perception, linguistics, semantics and sentiment analysis in dialogues and interactions, algorithmic and computational issues for the automatic recognition and synthesis of emotional states.'" Esposito, Anna; Esposito, Antonietta M; Martone, Raffaele; MÃ¼ller, Vincent C. and Scarpetta, Gaetano (eds.) (2011), Towards autonomous, adaptive, and context-aware multimodal interfaces: Theoretical and practical issues (LNCS, 6456; Berlin: Springer). 474 pp. Abstract: This volume brings together the advanced research results obtained by the European COST Action 2102: â€œCross Modal Analysis of Verbal and Nonverbal Communicationâ€�. The research published in this book was discussed at the 3rd joint EUCOGII-COST 2102 International Training School entitled â€œToward Autonomous, Adaptive, and Context-Aware Multimodal Interfaces: Theoretical and Practical Issues â€� and held in Caserta, Italy, on March 15-19, 2010.'" Kazazis, Ioannis N; MÃ¼ller, Vincent C. and Sistakou, Evina (eds.) (2003), Î£Ï…Î¼Ï†Ï�Î±ÏƒÏ„Î¹ÎºÏŒÏ‚ Ï€Î¯Î½Î±ÎºÎ±Ï‚ Î»Î­Î¾ÎµÏ‰Î½ ÏƒÏ„Î¿ Ï€Î¿Î¹Î·Ï„Î¹ÎºÏŒ Î­Ï�Î³Î¿ Ï„Î¿Ï… Î“Î¹ÏŽÏ�Î³Î¿Ï… Î£ÎµÏ†Î­Ï�Î· [Concordance to the poems of Georgios Seferis] (Thessaloniki: Centre for the Greek Language). 804 pp. Abstract: Concordance of the poetic works of Giorgos Seferis which presents all the principal â€œwordsâ€� of the texts in an alphabetical list, stating how often each word occurs, giving a precise location and a relevant piece of text for each occurrence. We found ca. 9500 different Greek words in 39000 different occurrences, so our concordance has 50.000 lines of text. The technical procedure required four main steps: text entry and tagging, production of the concordance, correction of the contexts, formatting for print. '" MÃ¼ller, Vincent C. (ed. ), (1993), Hilary Putnam: Von einem realistischen Standpunkt, Schriften zu Sprache und Wirklichkeit [From a realist point of view: Writings on language and reality], trans. Vincent C. MÃ¼ller (rowohlts enzyklopÃ¤die, 539; Reinbek: Rowohlt). 315 pp. Abstract: Einleitung	1 - Kritik des Positivismus: Realismus Â«Was kann ich wissen?Â» - 1 ErklÃ¤rung und Referenz (1973)	1 - 2 Sprache und Wirklichkeit (1975)	38 - 3 Was ist â€¹Realismusâ€º? (1975)	77 - Der dritte Weg: Interer Realismus statt metaphysischem Realismus oder Positivismus - 4 Modelle und Wirklichkeit (1980)	112 - 5 Referenz und Wahrheit (1980)	159 - 6 Wie man zugleich interner Realist und transzendentaler Idealist sein kann (1980)	191 - 7 Warum es keine Fertigwelt gibt (1982)	218 - Auf des Messers Schneide: Interner Realismus und Relativismus - 8 Wozu die Philosophen? (1986)	259 - 9 Realismus mit menschlichem Antlitz (1988/90)	284 - 10 Irrealismus und Dekonstruktion (1992)	330 - Bibliographie der Schriften von Hilary Putnam	363 - I BÃ¼cher	363 - II AufsÃ¤tze, VortrÃ¤ge und Vorlesungen	365 - III Ãœbersetzungen ins Deutsche	385 - Literaturverzeichnis	387 - Register	413 - '"
KrÃ¤mer, Werner; Mathwig, Frank and MÃ¼ller, Vincent C. (eds.) (1992-1998), BÃ¼cher zum Studium der evangelischen Theologie [Books for the study of protestant theology] (42, 43, 44, 45, 46, 47, 48 edn. ; Marburg/Lahn: Timbuktu). 288 pp. Abstract: Vorbemerkung - Mit diesem kleinen roten Buch gibt Ihnen Ihre Buchhandlung eine Orientierung in der gegenwÃ¤rtig lieferbaren theologischen Literatur an die Hand. In der vorliegenden Ausgabe im 47. Jahr 1997 ist die aktuelle Produktion von 158 Verlagen zur evangelischen Theologie sowie eine reprÃ¤sentative Auswahl aus der katholischen Theologie, den Religionswissenschaften und der Philosophie verzeichnet, wobei der Schwerpunkt auf neuerer Literatur liegt. Die etwa 8000 Titel sind in thematische Kapitel eingeordnet und Neuerscheinungen mit einem *Sternchen gekennzeichnet. Das gut 4600 Namen umfassende Register erschlieÃŸt Autoren, Herausgeber etc. ebenso wie das uÌˆber eine Person vorhandene Schrifttum. Herausgegebene Werke finden sich unter ihrem Titel; Schriften, die als Teil einer Reihe erschienen sind, unter dem Titel der Reihe. - Wir danken den Buchhandlungen, die es erst ermÃ¶glichen, diese bibliographische Hilfe und Marktorientierung der interessierten Ã–ffentlichkeit zur VerfuÌˆgung zu stellen. Des weiteren danken wir den Verlagen fuÌˆr die Bereitstellung der Daten (oft aktueller als das VLB), insbesondere jenen Verlagen, die durch ihre Anzeigen zur Finanzierung dieses Projekts beitragen â€“ siehe das Inserentenverzeichnis auf der letzten Seite. Trotz sorgfÃ¤ltiger Bearbeitung kÃ¶nnen wir fuÌˆr die Korrektheit der Angaben keine Garantie uÌˆbernehmen. Wir hoffen, daÃŸ Ihnen unsere Arbeit nuÌˆtzlich ist und freuen uns uÌˆber jede Art der Reaktion. Kontakt sowie Bestellung weiter Exemplare unter: - Timbuktu Verlag, Am Rain 20, 35039 Marburg, Telefon & Fax: 06421-62967, E-Mail: vcm@compuserve.com - Marburg, im MÃ¤rz 1997 - Die Herausgeber - ISSN 0343-0251'"
MÃ¼ller, Vincent C. (forthcoming), 'Ethics of AI and Robotics', in Edward N. Zalta (ed. ), Stanford Encyclopedia of Philosophy (Palo Alto: Stanford University). Abstract: Artificial intelligence (AI) and robotics are technologies that seem to be of major importance for the development of humanity in the near future. They have raised fundamental questions about what we should do with these systems, what the systems themselves should do, and what risks they have in the long term. They also challenge the human view of humanity as the intelligent and dominant species on Earth. The main division of the article is into issues that arise with AI systems as objects, i.e. tools used by humans (2), vs. AI systems as autonomous subjects, i.e. when ethics is for the AI systems themselves (3). This division should not be seen as proposing two neatly distinct classes, however, but rather as allowing degrees between the two, depending on the autonomy of the AI system. The problem of a future â€˜singularityâ€™ or â€˜superintelligenceâ€™ concerns ethical use of AI and the ethics for AI systems â€“ thus the separate final section (4). - In each section, we will have occasion to look at ethical issues that arise from utility of consequences, including â€˜riskâ€™, as well as issues that arise from a conflict with rules, virtues or values. In sections (3.2) and (4) we also discuss questions of a more theoretical nature about â€˜artificial moral agentsâ€™, in particular under which conditions an agent can be held responsible for their actions, and under which conditions an agent should be taken to have rights and obligations. MÃ¼ller, Vincent C. (forthcoming), 'Measuring progress in robotics: Benchmarking and the â€˜measure-target confusionâ€™', in Fabio Bonsignorio, et al. (eds. ), Metrics of sensory motor coordination and integration in robots and animals (Cosmos; Berlin: Springer Nature), 12. Abstract: While it is often said that robotics should aspire to reproduc- ible and measurable results that allow benchmarking, I argue that a fo- cus on benchmarking can be a hindrance for progress in robotics. The reason is what I call the â€˜measure-target confusionâ€™, the confusion be- tween a measure of progress and the target of progress. Progress on a benchmark (the measure) is not identical to scientific or technological progress (the target). In the past, several academic disciplines have been led into pursuing only reproducible and measurable â€˜scientificâ€™ results â€“ robotics should be careful to follow that line because results that can be benchmarked must be specific and context-dependent, but robotics targets whole complex systems for a broad variety of contexts. While it is extremely valuable to improve benchmarks to reduce the distance be- tween measure and target, the general problem to measure progress towards more intelligent machines (the target) will not be solved by benchmarks alone; we need a balanced approach with sophisticated benchmarks, plus real-life testing, plus qualitative judgment.'" MÃ¼ller, Vincent C. (2018), 'In 30 Schritten zum Mond? ZukÃ¼nftiger Fortschritt in der KI', Medienkorrespondenz, 20 (05.10.2018), 5-15. Abstract: Die Entwicklungen in der KuÌˆnstlichen Intelligenz (KI) sind spannend. Aber wohin geht die Reise? Ich stelle eine Analyse vor, der zufolge exponentielles Wachstum von Rechengeschwindigkeit und Daten die entscheidenden Faktoren im bisherigen Fortschritt waren. Im Folgenden erlaÌˆutere ich, unter welchen Annahmen dieses Wachstum auch weiterhin Fortschritt ermoÌˆglichen wird: 1) Intelligenz ist eindimensional und messbar, 2) Kognitionswissenschaft wird fuÌˆr KI nicht benoÌˆtigt, 3) Berechnung (computation) ist hinreichend fuÌˆr Kognition, 4) GegenwaÌˆrtige Techniken und Architektur sind ausreichend skalierbar, 5) Technological Readiness Levels (TRL) erweisen sich als machbar. Diese Annahmen werden sich als dubios erweisen. MÃ¼ller, Vincent C. and Hoffmann, Matej (2017), 'What is morphological computation? On how the body contributes to cognition and control', Artificial Life 23 (1), 1-24. Abstract: The contribution of the body to cognition and control in natural and artificial agents is increasingly described as â€œoff-loading computation from the brain to the bodyâ€�, where the body is said to perform â€œmorphological computationâ€�. Our investigation of four characteristic cases of morphological computation in animals and robots shows that the â€˜off-loadingâ€™ perspective is misleading. Actually, the contribution of body morphology to cognition and control is rarely computational, in any useful sense of the word. We thus distinguish (1) morphology that facilitates control, (2) morphology that facilitates perception and the rare cases of (3) morphological computation proper, such as â€˜reservoir computing.â€™ where the body is actually used for computation. This result contributes to the understanding of the relation between embodiment and computation: The question for robot design and cognitive science is not whether computation is offloaded to the body, but to what extent the body facilitates cognition and control â€“ how it contributes to the overall â€˜orchestrationâ€™ of intelligent behaviour. MÃ¼ller, Vincent C. (2017), 'Legal vs. ethical obligations â€“ a comment on the EPSRCâ€™s principles for robotics', Connection Science, 29 (2), 137-41. Abstract: While the 2010 EPSRC principles for robotics state a set of 5 rules of what â€˜shouldâ€™ be done, I argue they should differentiate between legal obligations and ethical demands. Only if we make this difference can we state clearly what the legal obligations already are, and what additional ethical demands we want to make. I provide suggestions how to revise the rules in this light and how to make them more structured. Hoffmann, Matej and MÃ¼ller, Vincent C. (2017), 'Simple or complex bodies? Trade-offs in exploiting body morphology for control', in Gordana Dodig-Crnkovic and Raffaela Giovagnoli (eds. ), Representation of Reality: Humans, Other Living Organisms and Intelligent Machines (SAPERE; Berlin: Springer), 335-46. Abstract: Engineers fine-tune the design of robot bodies for control purposes, however, a methodology or set of tools is largely absent, and optimization of morphology (shape, material properties of robot bodies, etc.) is lagging behind the development of controllers. This has become even more prominent with the advent of compliant, deformable or â€�softâ€� bodies. These carry substantial potential regarding their exploitation for controlâ€”sometimes referred to as â€�morphological computationâ€�. In this article, we briefly review different notions of computation by physical systems and propose the dynamical systems framework as the most useful in the context of describing and eventually designing the interactions of controllers and bodies. Then, we look at the pros and cons of simple vs. complex bodies, critically reviewing the attractive notion of â€�softâ€� bodies automatically taking over control tasks. We address another key dimension of the design spaceâ€”whether model-based control should be used and to what extent it is feasible to develop faithful models for different morphologies.'" Simpson, Thomas W and MÃ¼ller, Vincent C. (2016), 'Just war and robotsâ€™ killings', The Philosophical Quarterly, 66 (263), 302-22. Abstract: May lethal autonomous weapons systemsâ€”â€˜killer robotsâ€™â€”be used in war? The majority of writers argue against their use, and those who have argued in favour have done so on a consequentialist basis. We defend the moral permissibility of killer robots, but on the basis of the non-aggregative structure of right assumed by Just War theory. This is necessary because the most important argument against killer robots, the responsibility trilemma proposed by Rob Sparrow, makes the same assumptions. We show that the crucial moral question is not one of responsibility. Rather, it is whether the technology can satisfy the requirements of fairness in the re-distribution of risk. Not only is this possible in principle, but some killer robots will actually satisfy these requirements. An implication of our argument is that there is a public responsibility to regulate killer robotsâ€™ design and manufacture. MÃ¼ller, Vincent C. and Bostrom, Nick (2016), 'Future progress in artificial intelligence: A survey of expert opinion', in Vincent C. MÃ¼ller (ed. ), Fundamental Issues of Artificial Intelligence (Synthese Library; Berlin: Springer), 553-70. Abstract: There is, in some quarters, concern about highâ€“level machine intelligence and superintelligent AI coming up in a few decades, bringing with it significant risks for humanity. In other quarters, these issues are ignored or considered science fiction. We wanted to clarify what the distribution of opinions actually is, what probability the best experts currently assign to highâ€“level machine intelligence coming up within a particular timeâ€“frame, which risks they see with that development, and how fast they see these developing. We thus designed a brief questionnaire and distributed it to four groups of experts in 2012/2013. The median estimate of respondents was for a one in two chance that high-level machine intelligence will be developed around 2040-2050, rising to a nine in ten chance by 2075. Experts expect that systems will move on to superintelligence in less than 30 years thereafter. They estimate the chance is about one in three that this development turns out to be â€˜badâ€™ or â€˜extremely badâ€™ for humanity.'" MÃ¼ller, Vincent C. (2016), 'New developments in the philosophy of AI', in Vincent C. MÃ¼ller (ed. ), Fundamental Issues of Artificial Intelligence (Synthese Library; Berlin: Springer). Abstract: The philosophy of AI has seen some changes, in particular: 1) AI moves away from cognitive science, and 2) the long term risks of AI now appear to be a worthy concern. In this context, the classical central concerns â€“ such as the relation of cognition and computation, embodiment, intelligence & rationality, and information â€“ will regain urgency. '" MÃ¼ller, Vincent C. (2016), 'Editorial: Risks of artificial intelligence', in Vincent C. MÃ¼ller (ed. ), Risks of artificial intelligence (London: CRC Press - Chapman & Hall), 1-8. Abstract: If the intelligence of artificial systems were to surpass that of humans significantly, this would constitute a significant risk for humanity. Time has come to consider these issues, and this consideration must include progress in AI as much as insights from the theory of AI. The papers in this volume try to make cautious headway in setting the problem, evaluating predictions on the future of AI, proposing ways to ensure that AI systems will be beneficial to humans â€“ and critically evaluating such proposals.'" MÃ¼ller, Vincent C. (2016), 'Autonomous killer robots are probably good news', in Ezio Di Nucci and Filippo Santoni de Sio (eds. ), Drones and responsibility: Legal, philosophical and socio-technical perspectives on the use of remotely controlled weapons (London: Ashgate), 67-81. Abstract: Will future lethal autonomous weapon systems (LAWS), or â€˜killer robotsâ€™, be a threat to humanity? The European Parliament has called for a moratorium or ban of LAWS; the â€˜Contracting Parties to the Geneva Convention at the United Nationsâ€™ are presently discussing such a ban, which is supported by the great majority of writers and campaigners on the issue. However, the main arguments in favour of a ban are unsound. LAWS do not support extrajudicial killings, they do not take responsibility away from humans; in fact they increase the abil-ity to hold humans accountable for war crimes. Using LAWS in war would probably reduce human suffering overall. Finally, the availability of LAWS would probably not increase the probability of war or other lethal conflictâ€”especially as compared to extant remote-controlled weapons. The widespread fear of killer robots is unfounded: They are probably good news.'" MÃ¼ller, Vincent C. (2015), 'Which symbol grounding problem should we try to solve? ', Journal of Experimental and Theoretical Artificial Intelligence, 27 (1, ed. D. Jones & A. Beavers), 73-78. Abstract: Floridi and Taddeo propose a condition of â€œzero semantic commitmentâ€� for solutions to the grounding problem, and a solution to it. I argue briefly that their condition cannot be fulfilled, not even by their own solution. After a look at Luc Steelâ€™s very different competing suggestion, I suggest that we need to re-think what the problem is and what role the â€˜goalsâ€™ in a system play in formulating the problem. On the basis of a proper (syntactic) understanding of computing, I come to the conclusion that the only sensible grounding problem is how we can explain and re-produce the behavioral ability and function of meaning in artificial computational agents. MÃ¼ller, Vincent C. (2015), 'Gun control: A European perspective', Essays in Philosophy, 16 (2), 247-61. Abstract: From a European perspective the US debate about gun control is puzzling because we have no such debate: It seems obvious to us that dangerous weapons need tight control and that â€˜gunsâ€™ fall under that category. I suggest that this difference occurs due to different habits that generate different attitudes and support this explanation with an analogy to the habits about knives. I conclude that it is plausible that individ-ual knife-people or gun-people do not want tight regulatory legislation â€“ but tight knife and gun legislation is morally obligatory anyway. We need to give up our habits for the greater good. MÃ¼ller, Vincent C. (2014), 'Pancomputationalism: Theory or metaphor? ', in Ruth Hagengruber and Uwe Riss (eds. ), Philosophy, computing and information science (History and philosophy of technoscience; London: Pickering & Chattoo), 213-21. Abstract: The theory that all processes in the universe are computational is attractive in its promise to provide an understandable theory of everything. I want to suggest here that this pancomputationalism is not sufficiently clear on which problem it is trying to solve, and how. I propose two interpretations of pancomputationalism as a theory: I) the world is a computer and II) the world can be described as a computer. The first implies a thesis of supervenience of the physical over computation and is thus reduced ad absurdum. The second is underdetermined by the world, and thus equally unsuccessful as theory. Finally, I suggest that pancomputationalism as metaphor can be useful. â€“ At the Paderborn workshop in 2008, this paper was presented as a commentary to the relevant paper by Gordana Dodig-Crnkovic " Info-Computationalism and Philosophical Aspects of Research in Information Sciences".'" MÃ¼ller, Vincent C. (2014), 'Editorial: Risks of general artificial intelligence', Journal of Experimental and Theoretical Artificial Intelligence, 26 (3 - Special issue â€˜Risks of General Artificial Intelligenceâ€™, ed. V. MÃ¼ller), 297-301. Abstract: This is the editorial for a special volume of JETAI, featuring papers by Omohundro, Armstrong/Sotala/Oâ€™Heigeartaigh, T Goertzel, Brundage, Yampolskiy, B. Goertzel, Potapov/Rodinov, Kornai and Sandberg. - If the general intelligence of artificial systems were to surpass that of humans significantly, this would constitute a significant risk for humanity â€“ so even if we estimate the probability of this event to be fairly low, it is necessary to think about it now. We need to estimate what progress we can expect, what the impact of superintelligent machines might be, how we might design safe and controllable systems, and whether there are directions of research that should best be avoided or strengthened. Hoffmann, Matej and MÃ¼ller, Vincent C. (2014), 'Trade-offs in exploiting body morphology for control: From simple bodies and model-based control to complex ones with model-free distributed control schemes', in Helmut Hauser; Rudolf M FÃ¼chslin and Rolf Pfeifer (eds. ), Opinions and Outlooks on Morphological Computation (Zurich: E-Book), 185-94. Abstract: Tailoring the design of robot bodies for control purposes is implicitly performed by engineers, however, a methodology or set of tools is largely absent and optimization of morphology (shape, material properties of robot bodies, etc.) is lag- ging behind the development of controllers. This has become even more prominent with the advent of compliant, deformable or "soft" bodies. These carry substantial potential regarding their exploitation for control â€“ sometimes referred to as "mor- phological computation" in the sense of offloading computation needed for control to the body. Here, we will argue in favor of a dynamical systems rather than com- putational perspective on the problem. Then, we will look at the pros and cons of simple vs. complex bodies, critically reviewing the attractive notion of â€œsoftâ€� bodies automatically taking over control tasks. We will address another key dimension of the design space â€“ whether model-based control should be used and to what extent it is feasible to develop faithful models for different morphologies. --MÃ¼ller, Vincent C. This paper was also published in the 2014 AISB proceedings http://aisb50.org/representation-of-reality-humans-animals-and-machines/ - http://doc.gold.ac.uk/aisb50/'"
MÃ¼ller, Vincent C. (2012), 'Introduction: Theory and Philosophy of Artificial Intelligence', Minds and Machines, 22 (2), 67-69. Abstract: The theory and philosophy of artificial intelligence has come to a crucial point where the agenda for the forthcoming years is in the air. This special volume of Minds and Machines presents leading invited papers from a conference on the â€œPhilosophy and Theory of Artificial Intelligenceâ€� that was held in October 2011 in Thessaloniki (www.pt-ai.org). Artificial Intelligence is perhaps unique among engineering subjects in that it has raised very basic questions about the nature of computing, perception, reasoning, learning, language, action, interaction, consciousness, humankind, life etc. etc. â€“ and at the same time it has contributed substantially to answering these questions (in fact, it is sometimes seen as a form of empirical research). There is thus a substantial tradition of work, both on AI by philosophers and of theory within AI itself. - - The volume contains papers by Bostrom, Dreyfus, Gomila, O'Regan and Shagrir. - - This introduction has been re-published (p. VII-IX) in Vincent C. MÃ¼ller (ed. ), Theory and Philosophy of Artificial Intelligence (SAPERE; Berlin: Springer), together with the main volume of papers of PT-AI 2011. MÃ¼ller, Vincent C. (2012), 'From embodied and extended mind to no mind', in Anna Esposito, et al. (eds. ), Cognitive Behavioural Systems (LNCS/LNAI 7403; Berlin: Springer), 299-303. Abstract: The paper discusses the extended mind thesis with a view to the notions of â€œagentâ€� and of â€œmindâ€�, while helping to clarify the relation between â€œembodimentâ€� and the â€œextended mindâ€�. I will suggest that the extended mind thesis constitutes a reductio ad absurdum of the notion of â€˜mindâ€™; the consequence of the extended mind debate should be to drop the notion of the mind altogether â€“ rather than entering the discussion how extended it is.'" Gomila, Antoni and MÃ¼ller, Vincent C. (2012), 'Challenges for artificial cognitive systems', Journal of Cognitive Science, 13 (4), 453-69. Abstract: The declared goal of this paper is to fill this gap: â€œ... cognitive systems research needs questions or challenges that define progress. The challenges are not (yet more) predictions of the future, but a guideline to what are the aims and what would constitute progress.â€� â€“ the quotation being from the project description of EUCogII, the project for the European Network for Cognitive Systems within which this formulation of the â€˜challengesâ€™ was originally developed (http://www.eucognition.org). So, we stick out our neck and formulate the challenges for artificial cognitive systems. These challenges are articulated in terms of a definition of what a cognitive system is: a system that learns from experience and uses its acquired knowledge (both declarative and practical) in a flexible manner to achieve its own goals. MÃ¼ller, Vincent C. (2012), 'Autonomous cognitive systems in real-world environments: Less control, more flexibility and better interaction', Cognitive Computation, 4 (3), 212-15. Abstract: In October 2011, the â€œ2nd European Network for Cognitive Systems, Robotics and Interactionâ€�, EUCogII, held its meeting in Groningen on â€œAutonomous activity in real-world environmentsâ€�, organized by Tjeerd Andringa and myself. This is a brief personal report on why we thought autonomy in real-world environments is central for cognitive systems research and what I think I learned about it. MÃ¼ller, Vincent C. The theses that crystallized are that a) autonomy is a relative property and a matter of degree, b) increasing autonomy of an artificial system from its makers and users is a necessary feature of increasingly intelligent systems that can deal with the real-world and c) more such autonomy means less control but at the same time improved interaction with the system. MÃ¼ller, Vincent C. (2011), 'On the possibilities of hypercomputing supertasks', Minds and Machines, 21 (1), 83-96. Abstract: This paper investigates the view that digital hypercomputing is a good reason for rejection or re-interpretation of the Church-Turing thesis. After suggestion that such re-interpretation is historically problematic and often involves attack on a straw man (the â€˜maximality thesisâ€™), it discusses proposals for digital hypercomputing with â€œZeno-machinesâ€�, i.e. computing machines that compute an infinite number of computing steps in finite time, thus performing supertasks. It argues that effective computing with Zeno-machines falls into a dilemma: either they are specified such that they do not have output states, or they are specified such that they do have output states, but involve contradiction. Repairs though non-effective methods or special rules for semi-decidable problems are sought, but not found. The paper concludes that hypercomputing supertasks are impossible in the actual world and thus no reason for rejection of the Church-Turing thesis in its traditional interpretation. MÃ¼ller, Vincent C. (2011), 'Interaction and resistance: The recognition of intentions in new human-computer interaction', in Anna Esposito, et al. (eds. ), Towards autonomous, adaptive, and context-aware multimodal interfaces: Theoretical and practical issues (LNCS, 6456; Berlin: Springer), 1-7. Abstract: Just as AI has moved away from classical AI, human-computer interaction (HCI) must move away from what I call â€˜good old fashioned HCIâ€™ to â€˜new HCIâ€™ â€“ it must become a part of cognitive systems research where HCI is one case of the interaction of intelligent agents (we now know that interaction is essential for intelligent agents anyway). For such interaction, we cannot just â€˜analyze the dataâ€™, but we must assume intentions in the other, and I suggest these are largely recognized through resistance to carrying out oneâ€™s own intentions. This does not require fully cognitive agents but can start at a very basic level. New HCI integrates into cognitive systems research and designs intentional systems that provide resistance to the human agent.'" MÃ¼ller, Vincent C. (2011), 'The hard and easy grounding problems (Comment on A. Cangelosi)', International Journal of Signs and Semiotic Systems, 1 (1), 70. Abstract: I see four symbol grounding problems: 1) How can a purely computational mind acquire meaningful symbols? 2) How can we get a computational robot to show the right linguistic behavior? These two are misleading. I suggest an 'easy' and a 'hard' problem: 3) How can we explain and re-produce the behavioral ability and function of meaning in artificial computational agents?4) How does physics give rise to meaning? Dodig-Crnkovic, Gordana and MÃ¼ller, Vincent C. (2011), 'A dialogue concerning two world systems: Info-computational vs. mechanistic', in Gordana Dodig-Crnkovic and Mark Burgin (eds. ), Information and computation: Essays on scientific and philosophical understanding of foundations of information and computation (Boston: World Scientific), 149-84. Abstract: The dialogue develops arguments for and against a broad new world system - info-computationalist naturalism - that is supposed to overcome the traditional mechanistic view. It would make the older mechanistic view into a special case of the new general info-computationalist framework (rather like Euclidian geometry remains valid inside a broader notion of geometry). We primarily discuss what the info-computational paradigm would mean, especially its pancomputationalist component. This includes the requirements for a the new generalized notion of computing that would include sub-symbolic information processing. We investigate whether pancomputationalism can provide the basic causal structure to the world and whether the overall research program of info-computationalist naturalism appears productive, especially when it comes to new approaches to the living world, including computationalism in the philosophy of mind.'" MÃ¼ller, Vincent C. (2010), 'Î•Î¹ÎºÎ¬Î¶ÎµÎ¹ Î· Ï†Î¹Î»Î¿ÏƒÎ¿Ï†Î¯Î± Î³Î¹Î± ÎµÎ¼Ï€ÎµÎ¹Ï�Î¹ÎºÎ¬ Î´ÎµÎ´Î¿Î¼Î­Î½Î±; Î— Î³Î½Ï‰ÏƒÎ¹Î±ÎºÎ® Î´Î¹Î±Ï€ÎµÏ�Î±Ï„ÏŒÏ„Î·Ï„Î± Ï„Î·Ï‚ Î±Î½Ï„Î¯Î»Î·ÏˆÎ·Ï‚ [Does philosophy speculate about empirical facts? The cognitive penetrability of perception]', Noesis - The Journal of the Hellenic Cognitive Science Society, 6 (1), 161-64. MÃ¼ller, Vincent C. (2009), 'Would you mind being watched by machines? Privacy concerns in data mining', AI & Society, 23 (4), 529-44. Abstract: Data mining is not an invasion of privacy because access to data is only by machines, not by people: this is the argument that is investigated here. The current importance of this problem is developed in a case study of data mining in the USA for counterterrorism and other surveillance purposes. After a clarification of the relevant nature of privacy, it is argued that access by machines cannot warrant the access to further information, since the analysis will have to be made either by humans or by machines that understand. It concludes that the current data mining violates the right to privacy and should be subject to the standard legal constraints for access to private information by people. MÃ¼ller, Vincent C. (2009), 'Symbol grounding in computational systems: A paradox of intentions', Minds and Machines, 19 (4), 529-41. Abstract: The paper presents a paradoxical feature of computational systems that suggests that computationalism cannot explain symbol grounding. If the mind is a digital computer, as computationalism claims, then it can be computing either over meaningful symbols or over meaningless symbols. If it is computing over meaningful symbols its functioning presupposes the existence of meaningful symbols in the system, i.e. it implies semantic nativism. If the mind is computing over meaningless symbols, no intentional cognitive processes are available prior to symbol grounding. In this case, no symbol grounding could take place since any grounding presupposes intentional cognitive processes. So, whether computing in the mind is over meaningless or over meaningful symbols, computationalism implies semantic nativism. MÃ¼ller, Vincent C. (2009), 'From public data to private information: The case of the supermarket', in Maria Bottis (ed. ), Proceedings of the 8th International Conference Computer Ethics: Philosophical Enquiry (Corfu: Nomiki Bibliothiki), 500-07. Abstract: The background to this paper is that in our world of massively increasing personal digital data any control over the data about me seems illusionary â€“ informational privacy seems a lost cause. On the other hand, the production of this digital data seems a necessary component of our present life in the industrialized world. A framework for a resolution of this apparent dilemma is provided if by the distinction between (meaningless) data and (meaningful) information. I argue that computational data processing is necessary for many present-day processes and not a breach of privacy, while collection and processing of private information is often not necessary and a breach of privacy. The problem and the sketch of its solution are illustrated in a case-study: supermarket customer cards.'" MÃ¼ller, Vincent C. (2008), 'Representation in digital systems', in Adam Briggle; Katinka Waelbers and Philip Brey (eds. 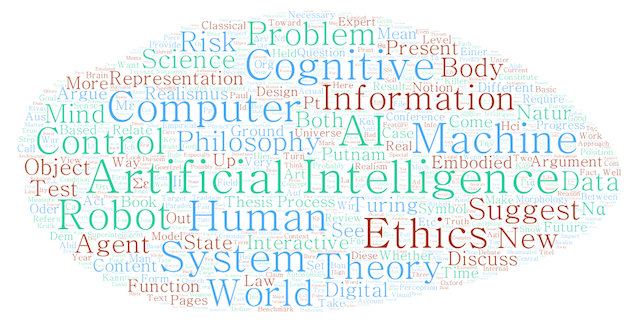 ), Current issues in computing and philosophy (Frontiers in Artificial Intelligence and Applications; Amsterdam: IOS Press), 116-21. Abstract: Cognition is commonly taken to be computational manipulation of representations. These representations are assumed to be digital, but it is not usually specified what that means and what relevance it has for the theory. I propose a specification for being a digital state in a digital system, especially a digital computational system. The specification shows that identification of digital states requires functional directedness, either for someone or for the system of which it is a part. In the case or digital representations, to be a token of a representational type, where the function of the type is to represent. [An earlier version of this paper was discussed in the web-conference "Interdisciplines" https://web.archive.org/web/20100221125700/http://www.interdisciplines.org/adaptation/papers/7 ]'"
MÃ¼ller, Vincent C. (2008), 'Î“Î¹Î± Ï„Î· Î´Ï…Î½Î±Ï„ÏŒÏ„Î·Ï„Î± Ï…Ï€ÎµÏ�-Ï…Ï€Î¿Î»Î¿Î³Î¹ÏƒÎ¼Î¿Ï� Ï€Î­Ï�Î± Î±Ï€ÏŒ Ï„Î·Î½ Ï…Ï€ÏŒÎ¸ÎµÏƒÎ· Church-Turing [On the Possibility of Hypercomputing beyond Church-Turing]', in Dimitra Sfendoni-Mentzou (ed. ), Î¦Î¹Î»Î¿ÏƒÎ¿Ï†Î¯Î± Ï„Î¿Î½ Î•Ï€Î¹ÏƒÏ„Î¹Î¼ÏŒÎ½ [Philosophy of Science], EFE 2006: Proceedings of the 10th Greek Association for Philosophy Conference (vol. I; Thessaloniki: Zitis), 407-14. Abstract: Î‘Ï…Ï„ÏŒ Ï„Î¿ Î¬Ï�Î¸Ï�Î¿ ÎµÎ¾ÎµÏ„Î¬Î¶ÎµÎ¹ ÎºÎ±Ï„Î¬ Ï€ÏŒÏƒÎ¿ Î¿ Ï…Ï€ÎµÏ�-Ï…Ï€Î¿Î»Î¿Î³Î¹ÏƒÎ¼ÏŒÏ‚ Î¿Î´Î·Î³ÎµÎ¯ Ï…Ï€Î¿Ï‡Ï�ÎµÏ‰Ï„Î¹ÎºÎ¬ ÏƒÎµ Î¼Î¹Î±Î½ Î±Î½Î±Î¸ÎµÏŽÏ�Î·ÏƒÎ· Ï„Î·Ï‚ Ï…Ï€ÏŒÎ¸ÎµÏƒÎ·Ï‚ Church-Turing. Î£Ï…Î¶Î·Ï„Î¬ÎµÎ¹ Ï€Ï�Î¿Ï„Î¬ÏƒÎµÎ¹Ï‚ Î³Î¹Î± Ï…Ï€Î¿Î»Î¿Î³Î¹ÏƒÏ„Î¹ÎºÎ­Ï‚ Î¼Î·Ï‡Î±Î½Î­Ï‚, Î³Î¹Î± Ï„Î¹Ï‚ Î¿Ï€Î¿Î¯ÎµÏ‚ Î»Î­Î³ÎµÏ„Î±Î¹ ÏŒÏ„Î¹ Ï…Ï€Î¿Î»Î¿Î³Î¯Î¶Î¿Ï…Î½ Î¬Ï€ÎµÎ¹Ï�Î± Î²Î®Î¼Î±Ï„Î± Ï…Ï€Î¿Î»Î¿Î³Î¹ÏƒÎ¼Î¿Ï� ÏƒÎµ Ï€ÎµÏ€ÎµÏ�Î±ÏƒÎ¼Î­Î½Î¿ Ï‡Ï�ÏŒÎ½Î¿, ÎµÎºÏ„ÎµÎ»ÏŽÎ½Ï„Î±Ï‚ Â«supertasksÂ». Î•Ï€Î¹Ï‡ÎµÎ¹Ï�Î·Î¼Î±Ï„Î¿Î»Î¿Î³ÎµÎ¯ ÏŒÏ„Î¹ Î±Ï…Ï„Î­Ï‚ Î¿Î¹ Ï€Ï�Î¿Ï„Î¬ÏƒÎµÎ¹Ï‚ Î¿Î´Î·Î³Î¿Ï�Î½ ÏƒÏ„Î¿ ÎµÎ¾Î®Ï‚ Î´Î¯Î»Î·Î¼Î¼Î±: ÎµÎ¯Ï„Îµ Î´ÎµÎ½ Ï€ÎµÏ�Î¹Î³Ï�Î¬Ï†Î¿Î½Ï„Î±Î¹ Î¼Îµ Ï„Î­Ï„Î¿Î¹Î¿ Ï„Ï�ÏŒÏ€Î¿ ÏŽÏƒÏ„Îµ Î½Î± Î­Ï‡Î¿Ï…Î½ Î±Ï€Î¿Ï„ÎµÎ»Î­ÏƒÎ¼Î±Ï„Î±, ÎµÎ¯Ï„Îµ Ï„Î± Î±Ï€Î¿Ï„ÎµÎ»Î­ÏƒÎ¼Î±Ï„Î± ÎµÎ¯Î½Î±Î¹ Î±Î½Ï„Î¹Ï†Î±Ï„Î¹ÎºÎ¬. Î†Ï�Î±, Î¿ Î¬Ï€ÎµÎ¹Ï�Î¿Ï‚ Ï…Ï€ÎµÏ�-Ï…Ï€Î¿Î»Î¿Î³Î¹ÏƒÎ¼ÏŒÏ‚ Î´ÎµÎ½ Î±Ï€Î¿Ï„ÎµÎ»ÎµÎ¯ Î»ÏŒÎ³Î¿ Î½Î± Î±Ï€Î¿Ï�Ï�Î¹Ï†Î¸ÎµÎ¯ Î· Ï€Î±Ï�Î±Î´Î¿ÏƒÎ¹Î±ÎºÎ® ÎµÏ�Î¼Î·Î½ÎµÎ¯Î± Ï„Î·Ï‚ Ï…Ï€ÏŒÎ¸ÎµÏƒÎ·Ï‚ Church-Turing. Î— Î´Î¹ÎµÏ�ÎµÏ�Î½Î·ÏƒÎ· Ï„Î¿Ï… Ï…Ï€Î¿Î»Î¿Î³Î¹ÏƒÎ¼Î¿Ï� Î¼Îµ Â«supertasksÂ» ÎµÏ€Î¯ÏƒÎ·Ï‚ Ï…Ï€Î¿Î´ÎµÎ¹ÎºÎ½Ï�ÎµÎ¹ ÏŒÏ„Î¹ ÏƒÏ…Î³ÎºÎµÎºÏ�Î¹Î¼Î­Î½Î± Â«supertasksÂ» ÎµÎ¯Î½Î±Î¹ Î±Î´Ï�Î½Î±Ï„Î±.'" MÃ¼ller, Vincent C. (2007), 'Is there a future for AI without representation? ', Minds and Machines, 17 (1), 101-15. Abstract: This paper investigates the prospects of AI without representation in general, and the proposals of Rodney Brooks in particular. What turns out to be characteristic of Brooks proposal is the rejection of central control in intelligent agents; his systems has as much or as little representation as traditional AI. The traditional view that representation is necessary for intelligence pre-supposes that intelligence requires central control. However, much of recent cognitive science suggests that we should dispose of the image of intelligent agents as central representation processors. If this paradigm shift is achieved, Brooks proposal for non-centralized cognition without representation appears promising for full-blown intelligent agents - though not for conscious agents and thus not for human-like AI. Raftopoulos, Athanassios and MÃ¼ller, Vincent C. (2006), 'The phenomenal content of experience', Mind and Language, 21 (2), 187-219. Abstract: We discuss at some length evidence from the cognitive science suggesting that the representations of objects based on spatiotemporal information and featural information retrieved bottom-up from a visual scene precede representations of objects that include conceptual information. We argue that a distinction can be drawn between representations with conceptual and nonconceptual content. The distinction is based on perceptual mechanisms that retrieve information in conceptually unmediated ways. The representational contents of the states induced by these mechanisms that are available to a type of awareness called phenomenal awareness constitute the phenomenal content of experience. The phenomenal content of perception contains the existence of objects as separate things that persist in time and time, spatiotemporal information, and information regarding relative spatial relations, motion, surface properties, shape, size, orientation, color, and their functional properties. Raftopoulos, Athanassios and MÃ¼ller, Vincent C. (2006), 'Nonconceptual demonstrative reference', Philosophy and Phenomenological Research, 72 (2), 251-85. Abstract: The paper argues that the reference of perceptual demonstratives is fixed in a causal nondescriptive way through the nonconceptual content of perception. That content consists first in spatiotemporal information establishing the existence of a separate persistent object retrieved from a visual scene by the perceptual object segmentation processes that open an object-file for that object. Nonconceptual content also consists in other transducable information, that is, information that is retrieved directly in a bottom-up way from the scene (motion, shape, etc). The nonconceptual content of the mental states induced when one uses a perceptual demonstrative constitutes the mode of presentation of the perceptual demonstrative that individuates but does not identify the object of perceptual awareness and allows reference to it. On that account, perceptual demonstratives put us in a de re relationship with objects in the world through the non-conceptual information retrieved directly from the objects in the environment. MÃ¼ller, Vincent C. (2006), 'Some information is too dangerous to be on the Internet', Computers and Society, 36 (1), 1-11. Abstract: This paper investigates a problem about freedom of information. Although freedom of information is generally considered desirable, there are a number of areas where there is substantial agreement that freedom of information should be limited. After a certain ordering of the landscape, I argue that we need to add the category of "dangerous" information and that this category has gained a new quality in the context of current information technology, specifically the Internet. This category includes information the use of which would be morally wrong as well as some of what may be called "corrupting" information. Some such information should not be spread at all and some should be very limited in its spread. MÃ¼ller, Vincent C. (2005), 'There must be encapsulated nonconceptual content in vision', in Athanassios Raftopoulos (ed. ), Cognitive penetrability of perception: Attention, action, attention and bottom-up constraints (Huntington: Nova Science), 157-70. Abstract: In this paper I want to propose an argument to support Jerry Fodorâ€™s thesis (Fodor 1983) that input systems are modular and thus informationally encapsulated. The argument starts with the suggestion that there is a â€œgrounding problemâ€� in perception, i. e. that there is a problem in explaining how perception that can yield a visual experience is possible, how sensation can become meaningful perception of something for the subject. Given that visual experience is actually possible, this invites a transcendental argument that explains the conditions of its possibility. I propose that one of these conditions is the existence of a visual module in Fodorâ€™s sense that allows the step from sensation to object-identifying perception, thus enabling visual experience. It seems to follow that there is informationally encapsulated nonconceptual content in visual perception.'" MÃ¼ller, Vincent C. (2002), 'Communicating the same information to a human and to a machine: Is there a difference in principle? ', in Konstantinos Boudouris and Takis Poulakos (eds. ), Philosophy of communication: Proceedings of the 13th international conference on Greek philosophy (IAGP 13) (2; Athens: Ionia), 168-76. Abstract: We try to show that there is no difference in principle between communicating a piece of information to a human and to a machine. The argumentation depends on the following theses: Communicating is transfer of information; information has propositional form; propositional form can be modelled as categorization; categorisation can be modelled in a machine; a suitably equipped machine can grasp propositional content designed for human communication. What I suggest is that the discussion should focus on the truth and precise meaning of these statements. However, in case these statements are true it follows that: For any act of communication that suc-cessfully transfers a piece of information to a human, that act could also transfer that piece of information to a machine.'" Raftopoulos, Athanassios and MÃ¼ller, Vincent C. (2002), 'Deictic codes, demonstratives, and reference: A step toward solving the grounding problem', in Wayne D. Gray and Christian D. Schunn (eds. ), CogSci 2002, 24th annual meeting of the Cognitive Science Society (Mahwah, NY: Lawrence Erlbaum), 762-67. Abstract: In this paper we address the issue of grounding for experiential concepts. Given that perceptual demonstratives are a basic form of such concepts, we examine ways of fixing the referents of such demonstratives. To avoid â€˜encodingismâ€™, that is, relating representations to representations, we postulate that the process of reference fixing must be bottom-up and nonconceptual, so that it can break the circle of conceptual content and touch the world. For that purpose, an appropriate causal relation between representations and the world is needed. We claim that this relation is provided by spatial and object-centered attention that leads to the formation of object files through the function of deictic acts. This entire causal process takes place at a pre-conceptual level, meeting the requirement for a solution to the grounding problem. Finally we claim that our account captures fundamental insights in Putnamâ€™s and Kripkeâ€™s work on â€œnewâ€� reference.'" MÃ¼ller, Vincent C. (2000), 'How do we read a dictionary (as machines and as humans)? Kinds of information in dictionaries constructed and reconstructed', in Evangelos Dermatas (ed. ), Proceedings of COMLEX2000: Computational lexicography (WCL; Patras: Patras University Press), 141-44. Abstract: Two large lexicological projects for the Center for the Greek Language, Thessaloniki, were to be published in print and on the WWW, which meant that two conversions were needed: a near-database file had to be converted to fully formatted file for printing and a fully formatted file had to be converted to a database for WWW access. As it turned out, both conversions could make use of existing clues that indicated the kinds of information contained in each particular piece of text, thus separating fields from each other and ordering them into a tree-like structure. This indicates that both forms of the dictionaries, print and database, stem from the same cognitive need to categorize information into a kind of information before further understanding â€“ be this for a human reader or for a machine.'" MÃ¼ller, Vincent C. and Kelter, Stephanie (1998), 'Too much substance â€“ not enough cognition. Commentary on Ruth Millikan: â€œA common structure for concepts of individuals, stuffs and real kindsâ€�', Behavioral and Brain Sciences, 21 (1), 80-81. Abstract: Millikanâ€™s account of substance concepts is based on a notion of â€œsubstanceâ€� expanded from realist notions of individuals and natural kinds. Her metaphysical notion, based on â€œinductive potential,â€� is shown to be too puristic and needs to incorporate cognizing subjects. This could preserve the realist/nondescriptionist insight that the extension of sub- stances is determined by the world. MÃ¼ller, Vincent C. (1997), 'Real vagueness', in Georg Meggle (ed. ), Analyomen 2: Perspectives in analytical philosophy (II: Philosophy of Language; Metaphysics; Berlin: de Gruyter), 398-403. Abstract: The nature of vagueness is investigated via a preliminary definition and a discussion of the classical sorites paradox ; this is carried further by asking for the origins of vagueness and a critique of several attempts to remove it from language. It is shown that such attempts are ill motivated and doomed for failure since vagueness is not just a matter of ignorance but firmly grounded in epistemic and metaphysical facts. Finally, the philosophical interest of real vagueness is illustrated by the concept of â€œnatural kindâ€�, which is essential to realism/anti-realism debates.'" MÃ¼ller, Vincent C. and Stein, Christian (1996), 'Epistemic theories of truth: The justifiability paradox investigated', in C. MartÃ­nez Vidal; U. Rivas Monroy and L. Villegas Forero (eds. ), Verdad: LÃ³gica, RepresentatiÃ³n y Mundo (Santiago de Compostela: Universidade de Santiago de Compostela), 95-104. Abstract: Epistemic theories of truth, such as those presumed to be typical for anti-realism, can be characterised as saying that what is true can be known in principle: p â†’ â—ŠKp. However, with statements of the form â€œp & Â¬Kpâ€�, a contradiction arises if they are both true and known. Analysis of the nature of the paradox shows that such statements refute epistem- ic theories of truth only if the the anti-realist motivation for epistemic theories of truth is not taken into account. The motivation in a link of understandability and meaningful- ness suggests to change the above principle and to restrict the theory to logically simple sentences, in which case the paradox does not arise. This suggestion also allows to see the deep philosophical problems for anti-realism those counterexamples are pointing at.'" MÃ¼ller, Vincent C. (1993), 'Einleitung [Introduction]', in Vincent C. MÃ¼ller (ed. ), Hilary Putnam: Von einem realistischen Standpunkt, Schriften zu Sprache und Wirklichkeit [From a realist point of view: Writings on language and reality] (rowohlts enzyklopÃ¤die; Reinbek: Rowohlt), 9-26. Abstract: Hilary Putnams Biographie und philosophische Entwicklung spiegeln die Geschichte der angelsÃ¤chsischen Philosophie in den letzten 40 Jahren. Beinahe ebenso lange hat Putnam diese Geschichte wesentlich beeinfluÃŸt und so kann John Passmore Ã¼ber Putnam schreiben: Â«Er ist die Geschichte der gegenwÃ¤rtigen Philosophie im UmriÃŸÂ»1. In der vorliegenden Einleitung soll vor allem der Kontext dargestellt werden, in dem Putnam steht und aus dem heraus verstÃ¤ndlich wird, was er philosophisch zu sagen hat. Dieser Kontext ist sicherlich ein Grund dafÃ¼r, daÃŸ Putnam hierzulande noch relativ wenig bekannt ist, wÃ¤hrend er in den USA hÃ¤ufig fÃ¼r den bedeutendsten aktiven Philosophen gehalten wird. Im Rahmen einer Skizze von Putnams philosophischer Entwicklung soll zudem eine vorlÃ¤ufige philosophiehistorische Einordnung versucht werden, auch wenn hier nicht der Ort fÃ¼r eine umfassende Kritik oder Darstellung sein kann: Die Einleitung muÃŸ auf recht elementarem Niveau bleiben und kann eine LektÃ¼re der Texte natÃ¼rlich nicht ersetzen. Da Putnams Werk sicherlich Teil einer AnnÃ¤herung von â€¹analytischerâ€º und â€¹kontinentalerâ€º Philosophie ist, soll bei der EinfÃ¼hrung in die hier Ã¼bersetzten Texte schlieÃŸlich deutlich werden, was Putnam nicht analytisch orientierten Lesern zu bieten hat. '" Abstract: Die gegenwaÌˆrtig unter dem Titel â€ºRealismusâ€¹ gefuÌˆhrten Debatten in der Philosophie befinden sich nach allgemeiner Ansicht in einem Zustand groÌˆÃŸter Verwirrung, so daÃŸ es nuÌˆtzlich erscheint, ein wenig Ordnung in die theoretischen Optionen zu bringen bevor man fuÌˆr die eine oder andere Auffassung Partei ergreift. In der vorliegenden Arbeit wird dafuÌˆr argumentiert, daÃŸ sich ein systematisch zusammenhaÌˆngendes Zentrum dieser Debatten mit Hilfe des Begriffes der Referenz ordnen laÌˆÃŸt. Nach der Analyse einiger klassischer Positionen soll ein Rahmen erstellt werden, innerhalb dessen die Positionen eingeordnet und die zentralen Probleme fruchtbar diskutiert werden koÌˆnnen. Zu diesem Zwecke ist es erforderlich, fuÌˆr die Einordnung der Positionen theoretische Kriterien zu benennen, die sich an den Problemen orientieren von denen hier argumentiert wird, das sie zentral seien. Sehr knapp ausgedruÌˆckt wird hier die Auffassung vertreten, Realismus sei als metaphysische These aufzufassen, welche eine von menschlichen epistemischen und semantischen MoÌˆglichkeiten unabhaÌˆngige Existenz behauptet; in den gegenwaÌˆrtigen Debatten typischerweise die Existenz einer Art von Dingen, nicht die eines individuellen Gegenstandes. Diese metaphysische These wird jedoch in der gegenwaÌˆrtigen Debatte mit semantischen Argumenten untermauert, bzw. angegriffen und jene semantischen Argumente wiederum verwenden epistemische ErwaÌˆgungen â€“ die Frage betreffend, was man wissen kann und was nicht. Der Beginn der gegenwaÌˆrtigen Realismusdebatten mit der soeben skizzierten zentralen Stellung semantischer Argumente ist, der hier vertretenen Auffassung zufolge, die Kritik am traditionellen Fregeschen Referenzbegriff durch Kripke und den fruÌˆhen Putnam um 1970 (Kap. 2). Aus dieser neu zu bewertenden Kritik und der von den Autoren daraus entwickelten externalistischen realistischen Semantik fuÌˆr ArtausdruÌˆcke laÌˆÃŸt sich das erste Kriterium fuÌˆr eine Position in einer Realismusdebatte ableiten und klaÌˆren (Kap. 3): HaÌˆlt man die fragliche Art fuÌˆr eine natuÌˆrliche Art und meint also, sie habe ihren â€ºZusammenhaltâ€¹ von Natur aus? Wenn ja, dann ist die fragliche Position eine realistische (das Kriterium ist dank des engen Zusammenhangs von Realismus und Externalismus sowohl hinreichend als auch notwendig). HaÌˆlt man die Art nicht fuÌˆr eine natuÌˆrliche Art, ist man Antirealist. Damit geht jeweils not- wendig eine bestimmte Semantik fuÌˆr den auf die Art referierenden Ausdruck einher. Es zeigt sich zugleich, daÃŸ es zwei Varianten des Realismus zu unterscheiden gilt, die hier als klassischer bzw. als moderater Realismus bezeichnet werden. Im folgenden (Kap. 4.1) wird argumentiert, daÃŸ der Begriff der Wahrheit nicht eigentlich der zentrale Punkt in den in Frage stehenden Realismusdebatten sein sollte, wie vielfach behauptet wurde, sondern seine Brisanz vielmehr aus zugrundeliegenden semantischen Fragen gewinnt die also in der weiteren Aufdeckung der Kriterien die zentrale Rolle spielen muÌˆssen. In der Analyse der Kritik an der in Kap. 3 entwickelten Position des â€ºklassischen Realismusâ€¹ laÌˆÃŸt sich ein zweites unterscheidendes Kriterium fuÌˆr Positionen in Realismusdebatten entwickeln: begriffliche RelativitaÌˆt. Nach der Ablehnung von Putnams Auffassungen zu diesem Thema, werden zwei Varianten vorgeschlagen, starke und schwache begriffliche RelativitaÌˆt (Kap. 4.2). Die Anwendung dieses Merkmals zwingt, so wird argumentiert, in einigen FaÌˆllen zu einer Kombination einer realistischen Auffassung von Arten als natuÌˆrliche mit begrifflicher RelativitaÌˆt. Diese mittlere Position zwischen klassischem Realismus und Antirealismus wird als Â»moderater RealismusÂ« bezeichnet. Der im ersten Kriterium verwendete Begriff der natuÌˆrlichen Art, und damit die Optionen in den Debatten, wird schlieÃŸlich mittels einer Dis- kussion des PhaÌˆnomens der Vagheit noch weiter verdeutlicht (Kap. 4.3). Ab- schlieÃŸend werden die drei Optionen zusammenfassend dargestellt und ein Versuch unternommen, ihre Fruchtbarkeit fuÌˆr diverse Realismusdebatten anzudeuten.'" MÃ¼ller, Vincent C. and Bostrom, Nick (2014), 'Future progress in artificial intelligence: A poll among experts', AI Matters, 1 (1), 9-11. Abstract: [This is the short version of: MÃ¼ller, Vincent C. and Bostrom, Nick (forthcoming 2016), â€˜Future progress in artificial intelligence: A survey of expert opinionâ€™, in Vincent C. MÃ¼ller (ed. ), Fundamental Issues of Artificial Intelligence (Synthese Library 377; Berlin: Springer).] - - - In some quarters, there is intense concern about highâ€“level machine intelligence and superintelligent AI coming up in a few dec- ades, bringing with it significant risks for human- ity; in other quarters, these issues are ignored or considered science fiction. We wanted to clarify what the distribution of opinions actually is, what probability the best experts currently assign to highâ€“level machine intelligence coming up within a particular timeâ€“frame, which risks they see with that development and how fast they see these developing. We thus designed a brief questionnaire and distributed it to four groups of experts. Overall, the results show an agreement among experts that AI systems will probably reach overall human ability around 2040-2050 and move on to superintelligence in less than 30 years thereafter. The experts say the probability is about one in three that this development turns out to be â€˜badâ€™ or â€˜extremely badâ€™ for humanity. MÃ¼ller, Vincent C. and Simpson, Thomas W (2014), 'Killer robots: Regulate, donâ€™t ban', University of Oxford, Blavatnik School of Government Policy Memo, November 2014, 1-4. Abstract: Lethal Autonomous Weapon Systems (â€˜LAWSâ€™) are here. Technological development will see them become widespread in the near future. This is in a matter of years rather than decades. When the UN Convention on Certain Conventional Weapons meets on 10-14th November 2014, well-considered guidance for a decision on the general policy direction for LAWS is clearly needed. While there is widespread opposition to LAWSâ€”or â€˜killer robotsâ€™, as they are popularly calledâ€”and a growing campaign advocates banning them outright, we argue the opposite. LAWS may very well reduce suffering and death in war. Rather than banning them, they should be regulated, to ensure both compliance with international humanitarian law, and that this positive outcome occurs. This policy memo sets out the basic structure and content of the regulation required. MÃ¼ller, Vincent C. (2013), '20 years after The Embodied Mind - why is cognitivism alive and kicking? ', in Joel Parthmore and Blay Whitby (eds. ), Re-Conceptualizing Mental "Illness": The View from Enactivist Philosophy and Cognitive Science - AISB Convention 2013 (Hove: AISB), 47-49. Abstract: I want to suggest that the major influence of classical arguments for embodiment like "The Embodied Mind" by Varela, Thomson & Rosch (1991) has been a changing of positions rather than a refutation: Cognitivism has found ways to retreat and regroup at positions that have better fortification, especially when it concerns theses about artificial intelligence or artificial cognitive systems. For example: a) Agent-based cognitivism' that understands humans as taking in representations of the world, doing rule-based processing and then acting on them (sense-plan-act) is often limited to conscious decision processes; and b) Purely syntactic cognition is compatible with embodiment, or supplemented by embodiment (e.g. for 'grounding'). While the empirical thesis of embodied cognition ('embodied cognitive science') is true and the practical engineering thesis ('morphological computation', 'cheap design') is often true, the conceptual thesis ('embodiment is necessary for cognition') is likely false - syntax is often enough for cognition, unless grounding is really necessary. I conclude that it has become more sensible to integrate embodiment with traditional approaches rather than "fight for embodiment" or "against cognitivism".'" MÃ¼ller, Vincent C. (2013), 'What is a digital state? ', in Mark J. Bishop and Yasemin J. Erden (eds. ), The Scandal of Computation - What is Computation? - AISB Convention 2013 (Hove: AISB), 11-16. Abstract: There is much discussion about whether the human mind is a computer, whether the human brain could be emulated on a computer, and whether at all physical entities are computers (pancomputationalism). These discussions, and others, require criteria for what is digital. I propose that a state is digital if and only if it is a token of a type that serves a particular function - typically a representational function for the system. This proposal is made on a syntactic level, assuming three levels of description (physical, syntactic, semantic). It suggests that being digital is a matter of discovery or rather a matter of how we wish to describe the world, if a functional description can be assumed. Given the criterion provided and the necessary empirical research, we should be in a position to decide on a given system (e.g. the human brain) whether it is a digital system and can thus be reproduced in a different digital system (since digital systems allow multiple realization).'" MÃ¼ller, Vincent C. (2011), 'Philosophy and Theory of Artificial Intelligence, 3â€“4 October (Report on PT-AI 2011)', The Reasoner, 5 (11), 192-93. MÃ¼ller, Vincent C. (2009), 'Review of Susan Stuart & Gordana Dodig Crnkovic (eds. ): 'Computation, Information, Cognition: The Nexus and the Liminal' (Newcastle: Cambridge Scholars Publishing, 2007)', Cybernetics & Human Knowing, 16 (3-4), 201-03. Abstract: Review of: "Computation, Information, Cognition: The Nexus and the Liminal", Ed. Susan Stuart & Gordana Dodig Crnkovic, Newcastle: Cambridge Scholars Publishing, September 2007, xxiv+340pp, ISBN: 9781847180902, Hardback: Â£39.99, $79.99 -MÃ¼ller, Vincent C. Are you a computer? Is your cat a computer? A single biological cell in your stomach, perhaps? And your desk? You do not think so? Well, the authors of this book suggest that you think again. They propose a computational turn, a turn towards computational explanation and towards the explanation of computation itself. The explanation of computation is the core of the present volume, but the computational turn to regard a wide variety of systems as computational is a potentially very wide-ranging project. MÃ¼ller, Vincent C. (2008), 'Margaret Boden 'Mind as Machine: A History of Cognitive Science' (2 vols., Oxford University Press 2006)', Minds and Machines, 18 (1), 121-25. Abstract: Review of: Margaret A. Boden, Mind as Machine: A History of Cognitive Science, 2 vols, Oxford: Oxford University Press, 2006, xlvii+1631, cloth $225, ISBN 0-19-924144-9. - Mind as Machine is Margaret Bodenâ€™s opus magnum. For one thing, it comes in two massive volumes of nearly 1700 pages, ... But it is not just the opus magnum in simple terms of size, but also a truly crowning achievement of half a centuryâ€™s career in cognitive science. MÃ¼ller, Vincent C. (2008), 'What a course on philosophy of computing is not', APA Newsletter on Philosophy and Computers, 8 (1), 36-38. Abstract: Immanuel Kant famously defined philosophy to be about three questions: â€œWhat can I know? What should I do? What can I hope for?â€� (KrV, B833). I want to suggest that the three questions of our course on the philosophy of computing are: What is computing? What should we do with computing? What could computing do? MÃ¼ller, Vincent C. (2005), 'Î¤Î¹ ÎµÎ¯Î½Î±Î¹ Î· Ï€Î±Ï„Ï�Î¯Î´Î± Î¼Î±Ï‚; [What is our fatherland? ]', Cogito, 3, 8-10. Abstract: Î Î¿Î¹Î± ÎµÎ¯Î½Î±Î¹ Î· Ï€Î±Ï„Ï�Î¯Î´Î± ÎºÎ¬Ï€Î¿Î¹Ï‰Î½; Î‘Ï‚ Î´Î¿Ï�Î¼Îµ Ï„Î¿ Î¸Î­Î¼Î± Î»Î¯Î³Î¿ ÏƒÎ±Î½ Ï€Ï�ÏŒÎ²Î»Î·Î¼Î± Ï„Î·Ï‚ Ï†Î¹Î»Î¿ÏƒÎ¿Ï†Î¯Î±Ï‚ Ï„Î·Ï‚ Î³Î»ÏŽÏƒÏƒÎ±Ï‚: Î³Î¹Î± Î­Î½Î± ÎºÎ±Ï„Î·Î³ÏŒÏ�Î·Î¼Î± Â«Î†Î³Î³Î»Î¿Ï‚Â» Â«Î“Î¬Î»Î»Î¿Ï‚Â», Â«Î Î¿Ï�Ï„Î¿Î³Î¬Î»Î¿Ï‚Â», Â«Î’Î­Î»Î³Î¿Ï‚Â», Â«Î¦Î»Î±Î¼Î±Î½Î´ÏŒÏ‚Â», Ï€ÏŽÏ‚ Î½Î± Î±Ï€Î¿Ï†Î±ÏƒÎ¯ÏƒÎ¿Ï…Î¼Îµ Ï€Î¿Î¹Î± Î±Î½Ï„Î¹ÎºÎµÎ¯Î¼ÎµÎ½Î± (Ï€Î¿Î¹Î¿Î¹ Î¬Î½Î¸Ï�Ï‰Ï€Î¿Î¹) ÎµÎ¼Ï€Î¯Ï€Ï„Î¿Ï…Î½ ÏƒÎµ Ï€Î¿Î¹Î¿ ÎºÎ±Ï„Î·Î³ÏŒÏ�Î·Î¼Î±; ÎˆÏ‡Î¿Ï…Î½ Ï„ÎµÎ»Î¹ÎºÎ¬ Î½ÏŒÎ·Î¼Î± Î±Ï…Ï„Î¬ Ï„Î± ÎºÎ±Ï„Î·Î³Î¿Ï�Î®Î¼Î±Ï„Î±; Î— Ï‡Ï�Î®ÏƒÎ· ÎºÎ±Î¹ ÎºÎ±Ï„Î¬Ï‡Ï�Î·ÏƒÎ· Î±Ï…Ï„ÏŽÎ½ Ï„Ï‰Î½ ÎºÎ±Ï„Î·Î³Î¿Ï�Î·Î¼Î¬Ï„Ï‰Î½ Î­Ï‡ÎµÎ¹ Î±Ï€Î¿Ï„ÎµÎ»Î­ÏƒÎµÎ¹ Î¼Î¹Î± Î±Ï€ÏŒ Ï„Î¹Ï‚ ÎºÏ…Ï�Î¹ÏŒÏ„ÎµÏ�ÎµÏ‚ Ï€Î·Î³Î­Ï‚ Î´Ï…ÏƒÏ„Ï…Ï‡Î¯Î±Ï‚ ÏƒÏ„Î· Î´Î¹Î¬Ï�ÎºÎµÎ¹Î± Ï„Ï‰Î½ Î´Ï�Î¿ Ï„ÎµÎ»ÎµÏ…Ï„Î±Î¯Ï‰Î½ Î±Î¹ÏŽÎ½Ï‰Î½ ÎºÎ±Î¹ ÏƒÏ…Î½ÎµÏ‡Î¯Î¶ÎµÎ¹ Î½Î± ÎµÎ¯Î½Î±Î¹ ÏƒÏ„Î·Î½ Î·Î¼ÎµÏ�Î®ÏƒÎ¹Î± Î´Î¹Î¬Ï„Î±Î¾Î·. Î£Ï…Î½Î®Î¸Ï‰Ï‚ ÎµÎ¼Ï†Î±Î½Î¯Î¶ÎµÏ„Î±Î¹ ÏƒÏ„Î± Ï€Î»Î±Î¯ÏƒÎ¹Î± Î±Î³ÏŽÎ½Ï‰Î½ Î³Î¹Î± Ï„Î·Î½ Î±Ï€ÏŒÎºÏ„Î·ÏƒÎ· Â«ÎµÎ»ÎµÏ…Î¸ÎµÏ�Î¯Î±Ï‚Â» ÏƒÎµ Î±Î½Ï„Î¹Ï€Î±Ï�Î¬Î¸ÎµÏƒÎ· Î¼Îµ Ï„Î·Î½ Â«ÎºÎ±Ï„Î±Ï€Î¯ÎµÏƒÎ·Â», ÎºÎ±Î¹ ÏƒÎµ Ï€Î±Î³ÎºÏŒÏƒÎ¼Î¹Î¿ ÎµÏ€Î¯Ï€ÎµÎ´Î¿ ÎºÎ±Î¹ ÎºÎ¿Î½Ï„Ï�Ï„ÎµÏ�Î± Î¼Î±Ï‚: ÏƒÏ„Î· ÎœÎ±ÎºÎµÎ´Î¿Î½Î¯Î±, Ï„Î·Î½ ÎšÎ±Ï„Î±Î»Î¿Î½Î¯Î±, Ï„Î·Î½ Î™Ï�Î»Î±Î½Î´Î¯Î±, Ï„Î¿ ÎšÎ¿Ï…Ï�Î´Î¹ÏƒÏ„Î¬Î½ ... Î�Î¿Î¼Î¯Î¶Ï‰ Ï€ÏŽÏ‚ Î±Ï�ÎºÎµÏ„Î¬ Î±Ï€ÏŒ Î±Ï…Ï„Î¬ Î²Î±ÏƒÎ¯Î¶Î¿Î½Ï„Î±Î¹ ÏƒÎµ Î»Î¬Î¸Î·. MÃ¼ller, Vincent C. (2004), 'â€œDer Mann mit Eigenschaftenâ€�, review of Joseph LeDoux: Im Netz der PersÃ¶nlichkeit: Wie unser Selbst entsteht [Synaptic Self], DÃ¼sseldorf: Walter Verlag 2003', SÃ¼ddeutsche Zeitung, (14.01.2004), 14. Abstract: Review of Joseph LeDoux: Das Netz der PersÃ¶nlichkeit. Wie unser Selbst entsteht. Walter Verlag, DÃ¼sseldorf 2003. 510 Seiten (mit Abbildungen), 39,90 Euro. - Der eine Mensch ist miÃŸtrauisch, der naÌˆchste leichtglaÌˆubig, diese ist warmherzig, jene kaltschnaÌˆuzig. Viele haben Charakter, manche sogar PersoÌˆnlichkeit. Wie kommt es dazu? In seinem neuen Buch untersucht der Neurowissenschaftler Joseph LeDoux wie unser Selbst entsteht. In dem sehr lesbaren und angenehm uÌˆbersetzten Werk wird anschaulich und detailliert berichtet, wie sich in unserem Gehirn die Charakteristika eines Individuums ausbilden. Sainsbury, Richard Mark (2001), Paradoxien, trans. Vincent C. MÃ¼ller (2nd, revised edn., Universal-Bibliothek, 18135; Stuttgart: Reclam). Abstract: Translation of "Mark Sainsbury: Paradoxes. Cambridge University Press, 2nd edition 1995" into German'"
Adams, Robert Merrihew (1998), 'Mittleres Wissen und das Problem des Ãœbels [Middle knowledge and the problem of evil]', trans. Vincent C. MÃ¼ller, in Christoph JÃ¤ger (ed. ), Analytische Religionsphilosophie (UTB; Berlin: Ferdinand SchÃ¶ningh), 253-72. Abstract: Wenn PrÃ¤sident Kennedy nicht erschossen worden wÃ¤re, hÃ¤tte er dann Nordvietnam bombardiert? Das weiÃŸ Gott allein. Oder doch nicht? WeiÃŸ wenigstens Er, was Kennedy getan hÃ¤tte? ... Die Jesuiten behaupteten unter anderem, daÃŸ viele menschliche Handlungen in dem Sinne frei seien, daÃŸ die AusfÃ¼hrenden nicht logisch oder kausal gezwungen seien, sie auszufÃ¼hren. (â€žFreiâ€œ wird im vorliegenden Aufsatz stets in diesem Sinne verwendet werden.) Wie behÃ¤lt Gott dann die Kontrolle Ã¼ber die menschliche Geschichte? Nicht dadurch, daÃŸ Er menschliche Handlungen kausal determiniert, wie die Dominikaner geglaubt zu haben scheinen , sondern indem Er UmstÃ¤nde herbeifÃ¼hrt, von denen Er weiÃŸ, daÃŸ wir in ihnen freiwillig Seinen PlÃ¤nen entsprechend handeln werden. '" Pike, Nelson (1998), 'Hume Ã¼ber Ãœbel [Hume on evil]', trans. Vincent C. MÃ¼ller, in Christoph JÃ¤ger (ed. ), Analytische Religionsphilosophie (UTB; Berlin: Ferdinand SchÃ¶ningh), 227-44. Abstract: In den Abschnitten X und XI der Dialoge Ã¼ber NatÃ¼rliche Religion legt Hume seine Ansichten zum traditionellen theologischen Problem des Ãœbels dar. Humes Anmerkungen zu diesem Thema scheinen mir eine reichhaltige Mischung aus Einsichten und IrrtÃ¼mern zu enthalten. Mein Ziel in diesem Aufsatz besteht darin, diese entgegengesetzten Elemente seiner Diskussion zu entwirren'"
Quinn, Philip L. (1998), 'Auf der Suche nach den Fundamenten des Theismus [In Search of the Foundations of Theism]', trans. Vincent C. MÃ¼ller, in Christoph JÃ¤ger (ed. ), Analytische Religionsphilosophie (UTB; Berlin: Ferdinand SchÃ¶ningh), 331-53. Abstract: Dieser Aufsatz ist eine kritische und erkundende Diskussion von Plantingas Behauptung, daÃŸ bestimmte Aussagen, aus denen evidentermaÃŸen folgt, daÃŸ Gott existiert, berechtigterweise basal sein kÃ¶nnten. Im kritischen Abschnitt argumentiere ich dafÃ¼r, daÃŸ es Plantinga nicht gelingt zu zeigen, daÃŸ das Kriterium des modernen Fundamentalisten fÃ¼r berechtigte BasalitÃ¤t, dem zufolge solche Aussagen nicht berechtigterweise basal sein kÃ¶nnen, selbstreferentiell inkohÃ¤rent oder anderweitig mangelhaft ist. Im erkundenden Abschnitt versuche ich, ein Argument fÃ¼r die Auffassung zu entwickeln, daÃŸ solche Aussagen, selbst wenn sie berechtigterweise basal sein kÃ¶nnten, wenn Ã¼berhaupt, nur selten berechtigterweise basal fÃ¼r intellektuell differenzierte erwachsene Theisten unserer Kultur wÃ¤ren.'" Schlesinger, George N. (1998), 'Leid und Ãœbel [Suffering and evil]', trans. Vincent C. MÃ¼ller, in Christoph JÃ¤ger (ed. ), Analytische Religionsphilosophie (UTB; Berlin: Ferdinand SchÃ¶ningh), 245-52. Abstract: Die Welt ist voller Leid. Gott ist entweder unfÃ¤hig, es zu verhindern â€“ dann ist Er nicht allmÃ¤chtig â€“, oder Er will es nicht verhindern â€“ dann ist Er nicht vollkommen gut. Seit Generationen wird dies als das schlagendste Argument gegen den Glauben angesehen, daÃŸ ein allmÃ¤chtiges und allgÃ¼tiges Wesen existiert. NatÃ¼rlich haben Theisten sich die grÃ¶ÃŸte MÃ¼he gegeben, eine angemessene Erwiderung vorzubringen. ... Selbst wenn nur ein einziges Individuum unnÃ¶tigerweise fÃ¼r einen kurzen Moment eine leichte Unannehmlichkeit zu ertragen hÃ¤tte, wÃ¤re das Problem logisch ebenso real â€“ obwohl es nicht so schmerzhaft wÃ¤re oder mÃ¶glicherweise sogar unbemerkt bliebe'"
MÃ¼ller, Vincent C. (1996), 'Review of Crispin Wright "Truth and Objectivity" (Harvard University Press 1993)', Erkenntnis, 44 (1), 119-23. Abstract: This book is a new attempt to clarify what is at issue in the contemporary realism debates and to suggest which form the controversies ought to take. Wright has contributed to the-se debates for quite some time and essentially taken the anti-realist side (witness the papers collected in Realism, Meaning and Truth, 1987, 21993, and the forthcoming Realism, Rules and Objectivity, both Oxford: Basil Blackwell). In Truth and Objectivity however, he takes a step back and sketches a neutral ground upon which both sides could agree in or-der to define their oppositions clearly, thus enabling fruitful discussions. His methodolog-ical suggestion for a realism debate in a given assertoric discourse is that both sides should agree on a â€œminimalâ€� concept of truth for that discourse and then see whether ascent to a more metaphysically substantial concept of truth is warranted, which would constitute a realism for the discourse in question. If Wright had managed to set the agenda in a way that does justice to both sides, this book would have constituted a major contribution to contemporary epistemology and metaphysics. MÃ¼ller, Vincent C. (1994), 'Review of Mark Sainsbury, Paradoxes (Cambridge University Press, 1988)', in Gianfranco Soldati (ed. ), European Review of Philosophy 1: Philosophy of Mind (Stanford: CSLI Publications), 182-84. Abstract: Review of Mark Sainsbury, Paradoxes (Cambridge University Press, 1988)'"
MÃ¼ller, Vincent C. (1993), 'Bibliographie der Schriften von Hilary Putnam [Bibliography of Hilary Putnam's Writings]', in Vincent C. MÃ¼ller (ed. ), Hilary Putnam: Von einem realistischen Standpunkt, Schriften zu Sprache und Wirklichkeit [From a realist point of view: Writings on language and reality] (rowohlts enzyklopÃ¤die; Reinbek: Rowohlt), 278-94. Reprint: Reprinted in Hilary Putnam: Pragmatism: An Open Question, Oxford: Blackwell 1995, 82â€“102. Abstract: Bibliography of the writings by Hilary Putnam: 16 books, 198 articles, 10 translations into German (up to 1994)'"
Sainsbury, Richard Mark (1993), Paradoxien, trans. Vincent C. MÃ¼ller (Universal-Bibliothek, 8881; Stuttgart: Reclam). Abstract: Translation of "Mark Sainsbury: Paradoxes. Cambridge University Press 1989" into German'"
MÃ¼ller, Vincent C. and Fagella, Dan (2016), 'Is Embodied Intelligence a Necessity for Flexible, Adaptive Thinking? â€“ A Conversation ', TechEmergence Podcasts (#149), 15.05.2016. Abstract: What is intelligence? For some researchers, it may be quite possible to create an intelligent machine â€˜in a boxâ€™, something without physical embodiment but with a powerful mind. Others believe general intelligence requires interaction with the outside world, inferring information from gestures and other features of functioning in an environment. Dr. Vincent MÃ¼ller is of the belief that intelligence may involve more than just mental algorithms and may need to include the capacity to sense rather than just run a program. Vincent focuses on cognitive systems as an approach to AI, and in this episode he talks about what this means and implies, how this approach is different from classical AI, and what this might permit in the future if the field is developed. MÃ¼ller, Vincent C. and Mazur, Susan (2013), 'Robots and the 1% â€“ Interview by Suzan Mazur', Scoop, (11.11.2013). MÃ¼ller, Vincent C. and Marsiske, Hans-Arthur (2013), 'Wir bauen keine kÃ¼nstlichen Menschen â€“ Interview mit H.-A. Marsiske', C'T, KW 43 (26.10.2013), 2. Abstract: EUCog ist ein Forschungsnetzwerk, das vor knapp acht Jahren ins Leben gerufen wurde. GegenwÃ¤rtig wird es unter dem Titel EUCogIII von der EuropÃ¤ischen Kommission noch bis Ende 2014 gefÃ¶rdert. Es umfasst jetzt ungefÃ¤hr 800 europÃ¤ische Wissenschaftler, die sich mit kuÌˆnstlichen kognitiven Systemen und Robotik beschÃ¤ftigen. Wir versuchen, ihnen die MÃ¶glichkeit zu geben, uÌˆber grundsÃ¤tzliche Fragen ihrer Forschung zu reflektieren, aber auch den Austausch mit anderen Communities zu fÃ¶rdern, etwa mit der industriellen Robotik oder mit Forschungen zum maschinellen Lernen.'" (2013), 'Smart robots, driverless cars work â€“ but they bring ethical issues too' [report on EUCog Conference], The Observer, (20.10.2013), 2. (2011), 'Robots seek role in reactors: Artificial cognitive systems will soon be able to play a greater role in dealing with problems such as Fukushima' [Report on European Robotics Forum], Professional Engineering 24/5, 04.05.2011, 2011. MÃ¼ller, Vincent C. and Salames, Alexandros (2009), 'Î— Ï„ÎµÏ‡Î½Î·Ï„Î® Î½Î¿Î·Î¼Î¿ÏƒÏ�Î½Î· ÎµÎ¯Î½Î±Î¹ ÎµÏ�Î³Î±Î»ÎµÎ¯Î¿ [Artificial intelligence is a Tool] - Interview by Alexandros Salames', Diadromes, Supplement to Aggelioforos, 319 (16.10.2009), 13. Breuer, Ingrid; Burri, Alex and MÃ¼ller, Vincent C. (1996), 'Wie realistisch kann der Realismus sein? Hilary Putnams Gratwanderung zwischen Metaphysik und Skeptizismus', Deutschlandfunk, 26.07.96, 20:10â€“21:00. Abstract: Wie realistisch kann der Realismus sein? Hilary Putnams Gratwanderung zwischen Metaphysik und Skeptizismus'"
1. After Stathis Psillos (Athens University & UWO, Canada) and Keith Frankish (Crete & OpenU). Then Katerina Ierodiakonou (Athens University), Aristides Baltas (former Minister of Culture, Athens University), Theodore Arabatzis (Athens University). - Of course, citation frequency (overall, per year, and h-index) is very loosely correlated to "academic quality" (and not correlated to "ability"). On the general limitations and value of research metrics, see the Leiden Manifesto (2015) in "Nature" and the Wikipedia entry on the h-index. Sadly, many professional philosophers refrain from making their citation 'profile' public. Note that almost all academic disciplines have much higher average citation numbers than philosophy. This is because of (a) higher publication frequency, and (b) higher citation frequency. Publication frequency (a) is about 2-5 times higher in non-humanities fields - in fact, merely the higher frequency of co-authoring would account for this difference; an additional factor is average publication length. Citation frequency (b) differs even more - judging by journal h-index and 2007 'aggregate citation rates', they seem to be around 3-7x for social sciences or engineering, and 10x for natural sciences and medicine (even within the sciences the difference of citation frequency can be 10x (2007) - but this combines publication and citation frequency). The cause for higher citation frequency is mainly that science papers use a lot more references than philosophy papers, even though the former are shorter. Also, citations in journals are recorded well in citation indexes, citations in books less so. (These factors also work favorably for philosophers who, like me, get cited in disciplines other than philosophy.) So, for comparison across disciplines, or even fields within them, one would have to multiply the two factors publication frequency and citation frequency: (a) x (b). ... In other words, such numbers are to be handled with care.